Age-related macular degeneration (AMD) is a disease that is associated with aging that slowly destroys the macula, the area where you get sharp central vision. AMD is slowly progressive, causes no pain, so often people rarely notice the small changes in their vision until there is a severe loss. common symptom of dry AMD is slightly blurred vision. Drusen are an early sign of Dry AMD. 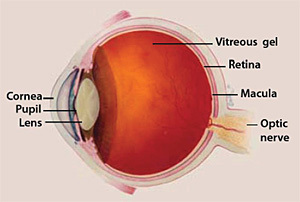 Drusen are yellow deposits under the retina. Dry AMD is more common. Dry AMD can progress into Wet AMD. Wet AMD is when abnormal vessels behind the retina grow under the macula, these vessels are very fragile and weak and often leak fluid or blood. This leaking causes the macula to raise from its normal place in the back of the eye. Wet AMD, also known as advanced AMD causes the progression of vision loss to advance more quickly. Wet AMD patients might complain of straight lines that appear wavy. Some risk factors for AMD include: Smoking, obesity, race (whites> african americans), family history, gender (women>men). However, lifestyle changes can play a role in reducing risk. Eating a healthy diet of green leafy vegetables and fish, not smoking, maintaining normal blood pressure, maintaining a healthy weight, and exercise, can all help reduce the risk. For patients that have someone in their lives who have suffered with vision loss from macular degeneration they know the importance of having their eyes examined by an optometrists yearly. But did you also know that Drs. Folwarski and Hayes also have a genetic test that can be done in the office that will give their patients with family history and early signs of the diease a prognosis of their disease?! This is a revolutionary genetic test that is helping doctors in our field save our patients vision with this sight threatening disease. Call our office today (636-273-3910) for your comprehensive eye examination and ask about the new MaculaRisk test!